Newsletter signup: Click here and do it! Learn how to cable with this easy tutorial. Bonus: You end up with a wonderful hat! This hat is perfect for the person in your life who thinks that going “wild” means buying a dark-green shirt instead of a blue shirt. 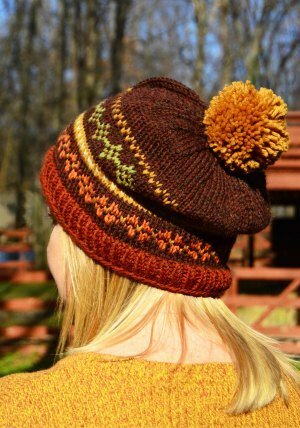 Choose two colors of yarn that are just a wee different so that the Fair Isle doesn’t show too much. Trust me. This will be a hit. Gauge is worked at your choice of 5.5, 5, or 4.5 stitches per inch. The only problem with this hat is that you'll get stopped and squealed at so many times that you won't get your Christmas shopping finished in time! 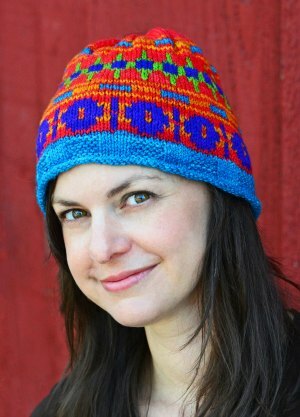 Note: This hat is made using stranded (Fair-Isle) technique, in the round, and assumes that you have used this technique before. 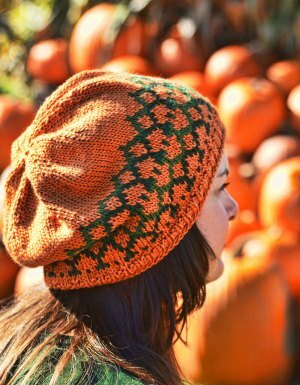 Relax on a fall afternoon; make a pleasant, easy Fair-Isle hat. Use scraps, and proceed with the colors of your imagination. Fair Isle never loses its appeal, with inviting choices of color, and never-ending interest during the knitting. 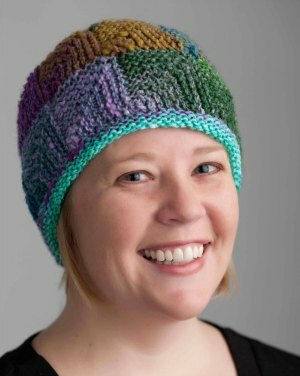 This hat has a little bonus: You will learn about corrugated ribbing. 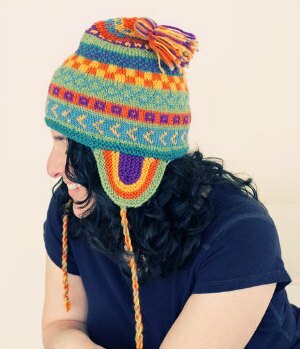 This hat is perfect for those who love and chase winter. 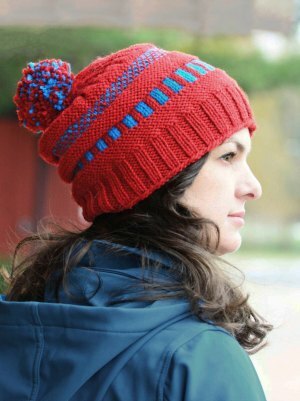 It knits up fast with only two colors (or of course more, if you feel like it), and it has a glorious pom pom! Designed by Cynthia Mazzant. That tempting self-striping yarn. You keep buying it and buying it. And buying it some more. The original small stash grows. Here's an easy way to make it look great. Rib for a while, and then work a few rounds of garter stitch to break it up. And back to ribs. A few decreases, and done. The hat is sized for either DK- or worsted-weight yarn. You’re feeling a bit of … Malaise? Vexation? You need something new. You need adventure, fighting, fencing, monsters, miracles—perhaps even true love. Or at the least, you need a new hat with beads to make you sparkle. 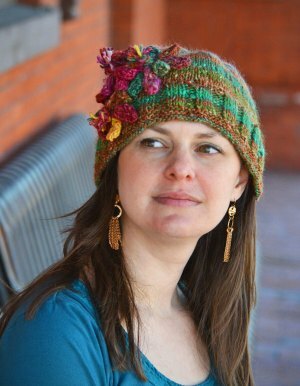 This hat is designed with a pretty band that frames the face and creates interest. 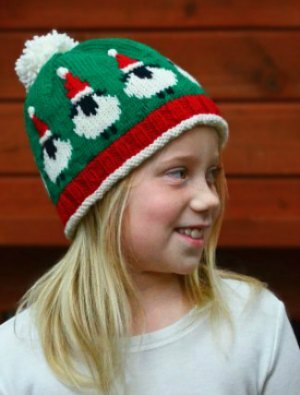 It is designed to be custom knit to the wearer’s size. Recommendations are in the pattern if you don’t know the exact head measurement. 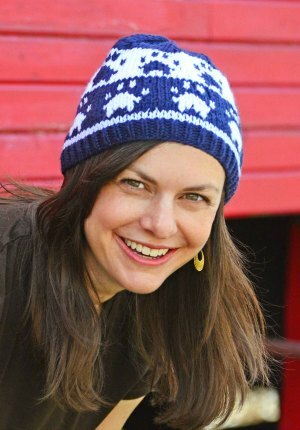 This flattering hat keeps things interesting by combining ribbing, Fair Isle, reverse stockinette, cabling, and every knitter’s dream: a pom-pom. You may use two colors, as pictured, or feel free to make it with all your scraps, just for fun! You are alone, waiting at the train station. About to wander across the country in an adventure of a lifetime. Free. You will savor unusual meals, contemplate new sights, and, as the train rolls along, simply enjoy the view of the flowers out the window. Your hat reflects them. 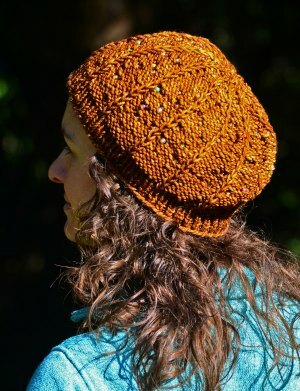 This hat is quick to make, easy to wear, and travels well. The instructions assume that you know how to do Fair Isle. If you don't, check out our First Fair Isle headband pattern for a tutorial, or look at the video tutorial at www.reallyclear.com. 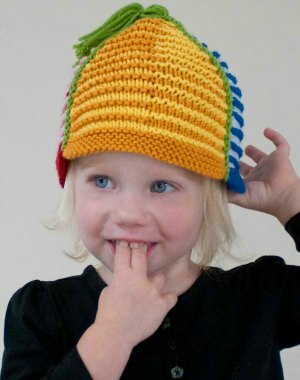 This hat is sized for babies (newborn) through adults (large). 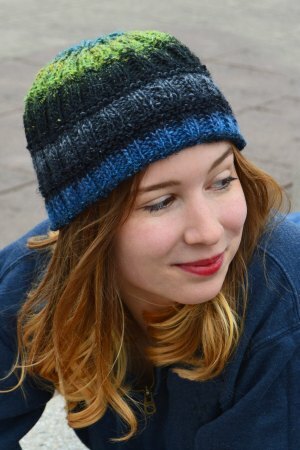 It has two options: slouchy and watch cap. Make it in any yarn that knits at either 5 or 5.5 stitches per inch. The instructions assume that you know how to knit in the round, do Fair Isle and read a Fair-Isle chart. If you do not, check our First Fair Isle headband pattern for a tutorial, or look at our video tutorial. I grew up and still live near Tussey Mountain. (I admit that it’s barely a hill if you live in the west.) And because of that, no matter where I travel, I find that the mountains are in me. Little or big, mountains always bring both a sense of adventure and a source of comfort. 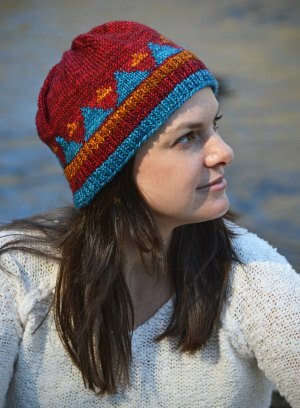 This Fair Isle hat depicts a series of mountains to keep you warm and cozy and feeling both protected and exhilarated! Experience with Fair Isle is assumed for this pattern. If you have never done Fair Isle, try our First Fair Isle headband, or check out our how-to video. 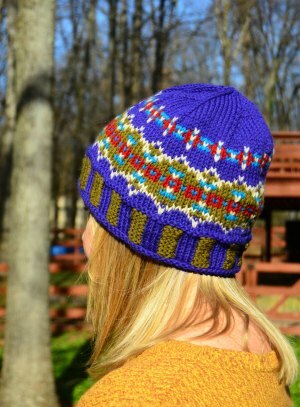 There is nothing like Fair Isle to give the knitter the creativity to combine vibrant colors with stunning patterns. This pattern will teach you everything you need to know to be able to make a headband. Your grandmother had a box full of buttons that you loved to play with as a kid. Later you grew up, and you had a button box all your own, filled with buttons that you were saving for someday. Now you can use them! Or even better, go to a local yarn store, where your friendly neighborhood button pusher will be happy to supply you with all the buttons you need to make as many hats as you wish. 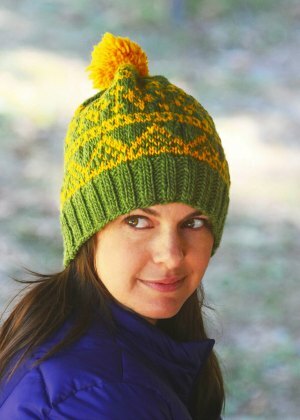 This easy little cabled hat will show off your favorites. Use small buttons for the little ones, larger for the grownups. The pattern assumes that you know how to cable and read a cable chart. The hat is sized for baby through adult. There's a bin in your closet, and it is filled with colorful little balls of yarn that you have kept: Scraps from so many projects. Scraps you couldn't bear to throw away because they were so beautiful. Scraps that are simply the aftermath of that Lizard Ridge blanket. Here is your chance to use them. If you need to learn to do Fair Isle, check out our video! The bold, graphic stars make this contemporary patriotic hat a must have—so go ahead and knit one, and then give three cheers for the red, white, and blue! Use cotton yarn to take the chill off a summer night, or use wool to celebrate all year long. 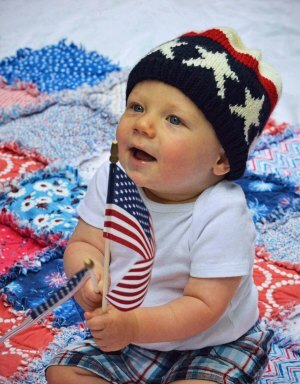 The hat is sized for babies (newborn) through adults (large), so that the whole family can be patriotic together. A headband option is also given. 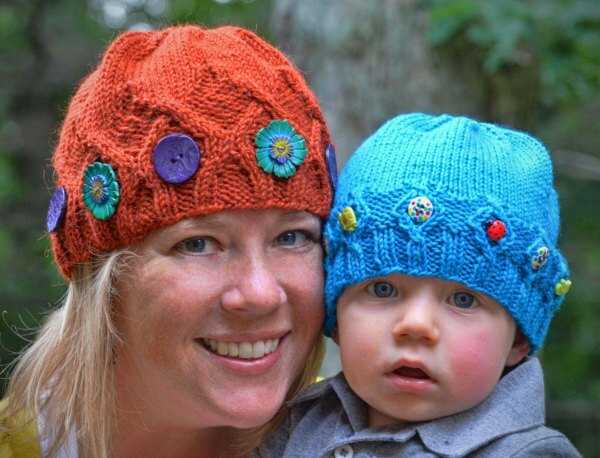 Make it in any yarn that knits at either 5 or 5.5 stitches per inch. The instructions assume that you know how to do Fair Isle. 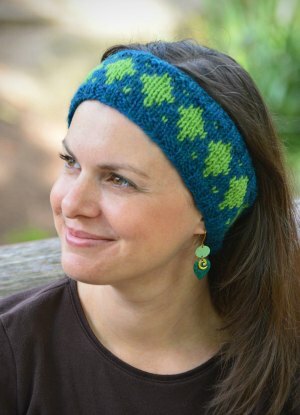 If you do not, check our First Fair Isle headband pattern for a tutorial, or look at our video. This hat will show your school spirit! …Well, that is, if your school has a mascot with a paw print! It is sized for infants, babies, children, women, and men, so that everyone in the family can have spirit. The instructions assume that you know how to do Fair Isle. If you do not, check our our First Fair Isle headband pattern for a tutorial, or look at our video tutorial. 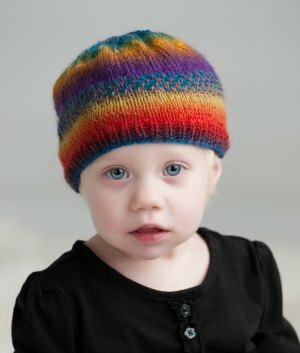 "Teegan" is a Gaelic word meaning “little poet”—and this hat is like a beautiful dance of colorful poetry! This pattern graphs the colors as shown in the photo, but of course feel free to use your imagination! The hat is sized for everyone from baby to adult male. Make one for everyone in the family, and face the gray winter with a bright spot of happiness! 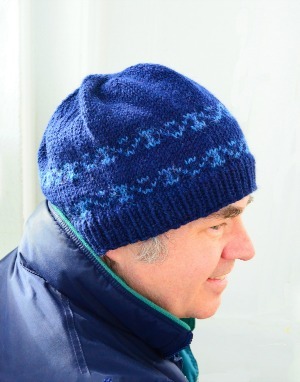 This pattern assumes that you know how to knit Fair Isle and pick up stitches. 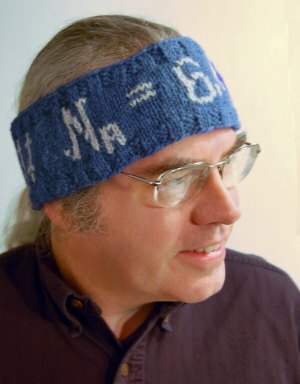 Take your pick of a headband for your favorite geek: chemistry (Avogadro's Number), math (pi), music ("I can't. I have rehearsal. "), astronomy (speed of light), grammar (they're there their), medicine (airway, breathing...), computer (zeros and ones), history (Veni, Vedi, Vici), Jane Austen (Mr. Fitzwilliam Darcy), and of course, knitting (YO, K2tog, K1, SSK)! Warm your loved ones on crisp winter evenings with a hat that celebrates the beauty of snow. This hat can be a festive part of Christmas time, but the sophisticated design with its not-quite Christmas colors will look beautiful all winter long. 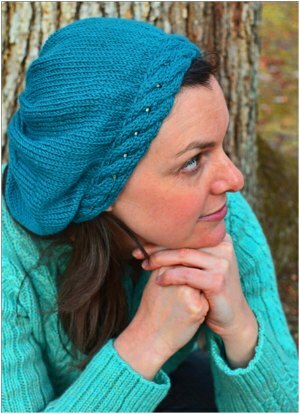 Slip & Bead is made using a reverse stockinette pattern and slip stitches to show off your beautiful beads. Go find yourself some sock yarn that stripes, and knit up this fast and easy baby hat in a few hours. A little bit of half-linen stitch makes it interesting. We call this hat “niece ready.” You are guaranteed to retain your status as the favorite aunt or uncle if you make her one! Small cables provide beautiful drape that gives style as well as warmth. This darling lace hat harkens back to the Roaring ‘20s. It looks fancy but is simple and fun to knit. Sizing is accomplished via yarn weight. 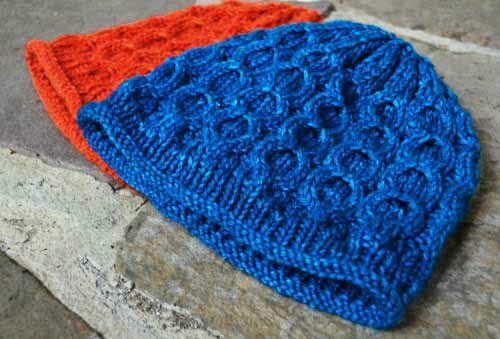 The lace pattern is easily memorized, and the knitting goes quickly. Shadow knitting or Illusion knitting is a simple technique that combines knit and purl stitches to create ridges that allow shapes to appear and disappear as the viewer’s angles change. “Shadow Play” is a simple pattern that will introduce you to the technique. This hat is made in 3 wedges, each of which uses a simple shadow-knitting technique to create the illusion of 6 wedges. A cute tassel or pom-pom at the top finishes off the look! Intarsia is like a jigsaw puzzle for knitters. It is knitting formed from blocks of color, each knit with separate strands of yarn. Most intarsia patterns are for kids. But sometimes grownups want an intarsia project for themselves—one that doesn’t involve duckies or airplanes. Here it is. It’s a simple process to knit using an intarsia pattern, but many knitters have not done it before, and on the surface it can look intimidating. This pattern goes through the process step by step, gives lots of tips for making it easier, and explains how to get a great look. Make the background or the motif the light or dark—your choice! The instructions give you either a hat that fully covers the ears or a hat that is a bit shorter. 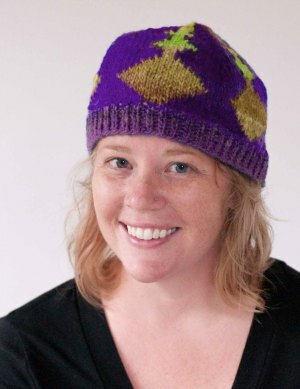 This hat is made with a series of small mitered squares. (Even the top is mitered.) It's a great little project for learning not only how to make mitered squares, but also how to pick up stitches. Using a variegated or self-striping yarn makes the miters extra fun! 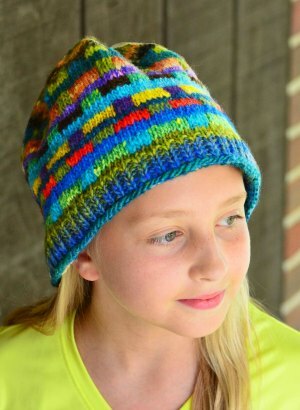 This versatile hat can be made with a rolled brim for a feminine look, or with a ribbed brim for the whole family. 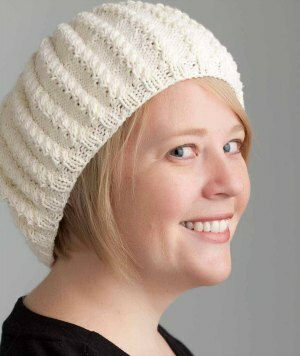 Rib it from beginning to end, and you have a classic beanie! It is sized for men, women, and children. The learning version of the pattern (HT-001L) contains detailed photos to help beginning knitters. This pattern has step-by-step photos with much detail. It will show you…. * How to use circular needles. * How to join in a circle without twisting. * How to use double-pointed needles. * How to knit two stitches together. * The visual difference between the front and back of the fabric. * How to join yarn if you run out. * How to weave in yarn.